This year I headed into autumn with a plan. A cunning plan. A plan so good I needed to sit down and have a Caramello Koala to celebrate when it was done. 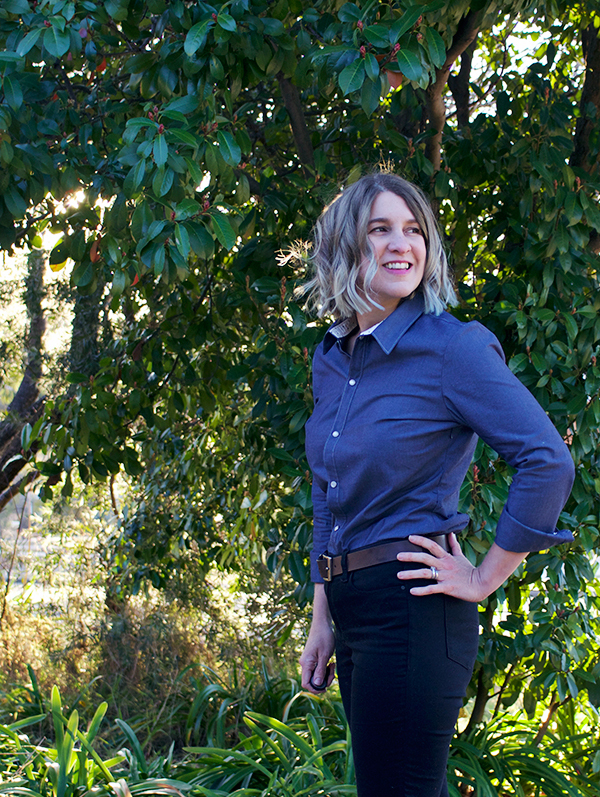 Drumroll please… I designed a capsule wardrobe. Boom! Adulting win. It had ten key pieces and I identified patterns that would work, ordered fabrics and arranged notions and had all my little sewing ducks lined up in a row. And then life happened and my well planned sewing got put to the side. But never fear! Seasons may change, the temperature may drop below zero but those ace autumnal pieces will get sewn ready in time to wear for autumn 2018! So please welcome my first autumn 2017 capsule wardrobe piece with a rousing cheer. Huzzah! The fabric is a chambray cotton shirting from The Fabric Store. It is super lovely, has a nice tight weave and presses like a dream. In hindsight, I think this chambray was a bit too structured for this top. I feel like every time I move it appears like there are bananas drag lines everywhere drawing the eye. Oh well, you live and you learn. Next time I would go for a tencel blend so there is a bit more drape. Or a patterned print. Because, repeat after me, patterns hide our sewing sins! Tower plackets are not yet my friends. My first one was hideously mishappened and any resemblance to an actual tower placket was coincidental. My second attempt was much better and is what I would call “tower placket-esque”. I seriously love how sewing continues to give me new skills to learn and improve upon. And also reasons to invent fabulous insults as I screw something up for the twelfth time! Alterations wise, I took the advice of a friend who has made this pattern a number of times and measured the sleeves. As a result, I removed 1.5cm from the length to get them to a length I was happy with. Which in hindsight really doesn’t matter because I always where long sleeved shirts cuffed (ugh to things touching my wrist!). I also moved the placement of the buttonholes/snaps so there was one placed in line with my bust apex. I’ve learned that lesson the hard way with many of my previous tops needing to be safety pinned shut to avoid gaping. It’s not quite the perfect placement but it’s getting there. I also had fun making this a bit more Amanda-ish with some pearl snaps, polka dot collar stand fabric and some sassy pink patterned hem binding. Check it out! The fit. Whilst I love the boxy men’s shirt feel of the Archer there is something rad about having a top fit at my bust, waist and hips. And back princess seams are the best! My Springfield top totally converted me. All the lovely details. Who can say no to some sweet top stitching and fancy tower plackets? Probably a bunch of people but not this sassy lady! PRINT TO SCALE!!!! Hmmm… it appears that I am still quite vexed about that little mishap which has made everything just a smidge too small. Grrr. Try this in a tercel blend. 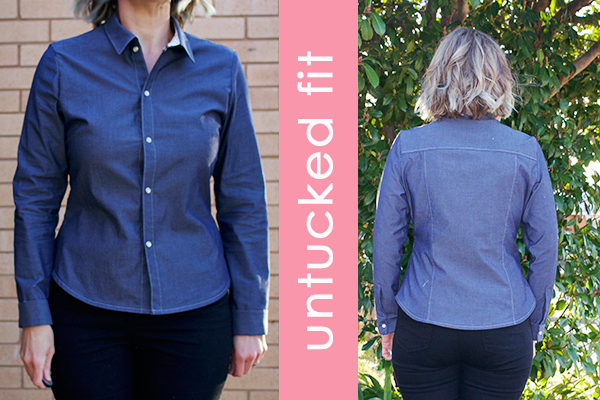 I feel like it just needs a smidge more drape – also I want to relive the 90s when tencel was a huge thing at all the jeans shops in Australia. Work on my button placement. It’s still not quite right. Overall, I think this is a pretty good rescue job of a bad situation. Whilst the fabric is a little too stiff and the fit is a bit small thanks to the print fail it’s still a wearable number. Now I just need to find the perfect chambray tencel and try again… Any suggestions on a fabric supplier welcome! I love this and yet somehow this pattern has never quite made it onto my radar before. Congrats on the super-adulting there with planning a capsule wardrobe. I’m going to have a go at planning one this autumn! That printing business to scale can really get you! I was a tiny bit luckier in that my husband was with me last time I picked up a couple of PDFs at the printers. They handed me the package all wrapped up and my husband said, “Aren’t you going to check it first?” A little sheepish, I opened the bag and in it were patterns just right for a barbie doll! I said, “Do you think I’m making doll clothes?? ?” The guy behind the counter obviously had no idea what I was talking about and shrugged, embarrassed I would make such a big deal out of making doll clothes 🙂 This is only the 3rd time I’ve had patterns printed at the print shop and I kid you not, 3 different visits to 3 different print shops for patterns and they screwed it up every single time. Batting a 1000 as they say. I HATE PDF patterns!! I avoid them like the plague in general principle and now I simply refuse them totally. The last mishap (if it was a mishap?) was from pattern review. Deepika said she’s now printing PDFs so you can order the pattern from her and she’ll print it off in large format and mail it to you. I thought, “YAY someone who knows what they’re doing with PDF patterns!” The large format patterns arrived minus instructions. Now I can download those myself and print them off but wouldn’t you think they would be included in the package? I’ve never had these issues with printed patterns 🙂 In any case I love your blouse! I’m so impressed you went ahead anyway and sewed it up with tiny seam allowances! You’re more adaptive than me 🙂 I would tossed the works into the bin! This is really nice! I want to make one too! I like the fabric. It is such a snazzy fitted top! I’m going to get that tercel blend one made STAT! OMG the dramas I have had at Officeworks trying to get A0s printed. They have accidentally printed pattern on photo canvas (to scale), rotated a pattern to print horizontally when it needed to be vertical, and flat out claimed that A0 printing to scale was not possible. I have reached the point where I now make them turn the screen around and show me that that they have checked the ‘print actual size’ box now. I really feel your pain. However your shirt looks great! Ugh! How can it be so dang hard to print stuff? And so lad to hear that you also turn the screen around. Sometimes it the only way! But my real question is: did you hang that pattern on the photo canvas? Mwah ha ha! I hope they gave you that one for free! Oh such a pain on the printing! The Cloth Shop in Ivanhoe has some lovely denim tencel, I’m sure Kim would send you some samples! How’d you go with setting the snaps? Was it easy? For the absolute best ever tower placket pattern piece and instructions, Folkwear’s Western shirts. I stick it onto everything now, no more stupid little bias strips fiddle faddle! Ohh! Thank you for the tip! I just found a copy on Easy – will check it out. So long bias strips!!! Also the shirt is da bomb. You get a puppy. love this on you! can you tell me if you did an FBA? I noticed you graded the sizes, was that enough to get a good fit or would you recommend doing an FBA.